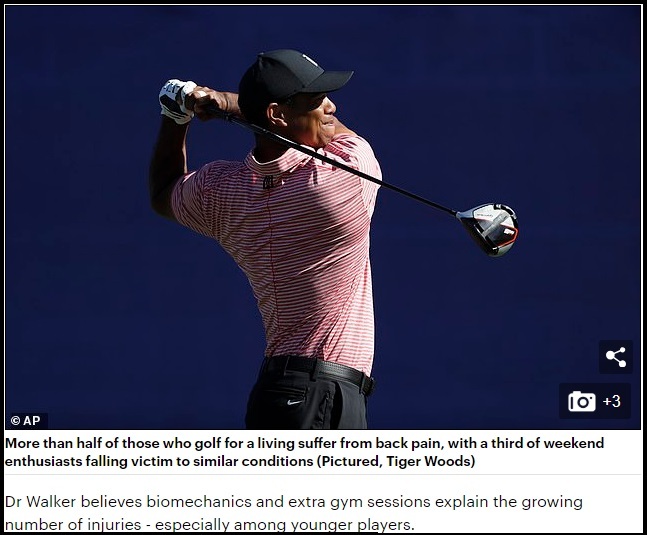 Now, I don’t know what has taken so long for this to come about – I have blogged about how, with no personal education or experience in the field of kinesiology or biomechanics, I determined very early in my golf swing research that swinging in this manner was not mechanically-sound. I have never injured myself swinging a golf club, even though I was only ever taught the Modern Golf Swing when I took lessons from two different instructors in the late 90’s, and the modern style of planted-heel swinging was the model I first took up at the outset in 2005. That’s because, while going back and forth between the lifting leading heel Classic Golf Swing and the planted-heel Modern Golf Swing, I never swung in the Modern style for very long, and by 2008, a sore left knee made me abandon swinging that way altogether. “It shouldn’t hurt to swing a golf club,” I said to myself, and I rejected it from then on. Modern golf has triggered an epidemic of back pain among players, according to new research. A focus on strength over style is making spinal injuries common among both amateurs and professionals. … The sport is extremely exerting and even endangering to public health, scientists say. I bolded that 2nd sentence because that is the very essence of contravening the rule of athletic motion – it must me mechanically-sound, because if it is not, it will lead to injuries, and every other sport but golf focuses intensely on mechanically-sound technique to avoid injury. In golf, the mantra is that people swing all sorts of ways and the there is more than one way to get the ball in the hole. I say so because of the 4th sentence, also in bold. You must swing mechanically-correctly if you want to reduce the risk of injury a and, if you’re a pro, it’s even more important because professional players need to play to earn money, and a shortened career is a loss of income opportunity. Anyone teaching or analyzing golf swings who doesn’t see an issue with the 2nd and 4th sentences above should be asking themselves what other “sport” on earth advocates leaving mechanically-sound technique out of the equation when discussing performance. The answer is, none, of course. A golf swing causes the spine to rotate at a tilt repeatedly which then stresses the backbone. This repeated stress has now led to a condition dubbed ‘repetitive traumatic discopathy’ or RTD. This is further stressed when players participate in intensive strength-training sessions. During the down swing, greater force is directed toward the spinal disc and joints which makes them crooked. A previous study of Japanese professional golfers demonstrated this for the first time on X-Ray images. I would reassure those who swing with a mechanically-sound model that they are not in danger of the above situation. I have a significant spinal deformity myself (scoliosis), and I was fortunate to have played sports all of my youth – my family doctor told my mother when I was around 10 or 11 years old that, because of my active participation in sports such as track & field, hockey, baseball etc, my back muscles were stronger than the average child’s and that kept my spinal deformity from progressing. I then took up golf in my mid-20’s, quit over frustration with not being able to learn a proper golf swing after a lifetime of high performing in other sports, and finally, stubbornly, began to study the swing 14 years ago next June, at the age of 35, because I was going to figure it out, come hell or high water. I would have wrecked my back and left knee had I continued to play golf with that type of swing, but as I said, I rejected that model early in my research. And after tens of thousands of swings (I would hit 500-600 balls per day in the season during the first years before I deduced that quality beats quantity), I have had no back issues or injuries, even with scoliosis, because I’ve been swinging with my hips & legs with the Classic Golf Swing, and not by torquing my lower back against restricted hips! 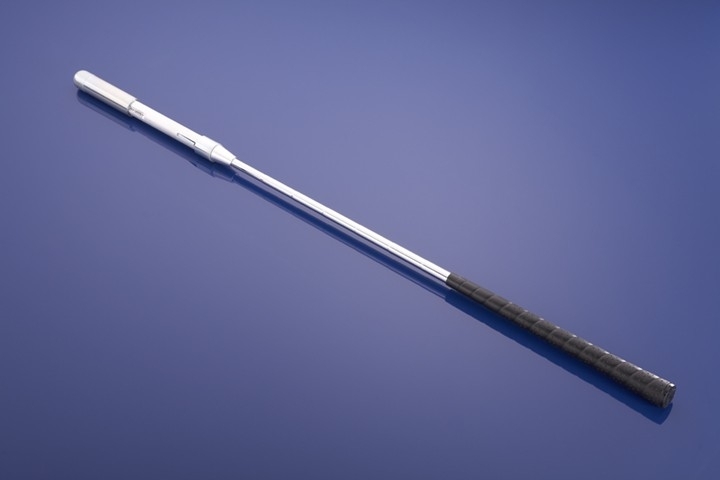 So, you can swing a golf club without wrecking your back and significantly reducing your joy of the game and quality of life – you just have to do it with mechanical-soundess. After all, you only have one spine, and if you wreck that, it’s game over, literally. It actually makes me wonder why Sam and Ben and Jack are hailed as the greatest swingers, but then nobody teaches how to swing like they did! Snead is my favorite swing of all time. I’d love to see an analysis of his swing from you DJ. The analysis would be very simple, DL – Snead’s swing model was basically the MCS swing model. He used the hips and legs to pivot to the top and then leveraged the club down and through. The “drop” was excellent, using leading side leverage to get the hands and club to “3 O’Clock,” and the only thing I’d change was to release the trailing foot to avoid the leading foot and leg snap.